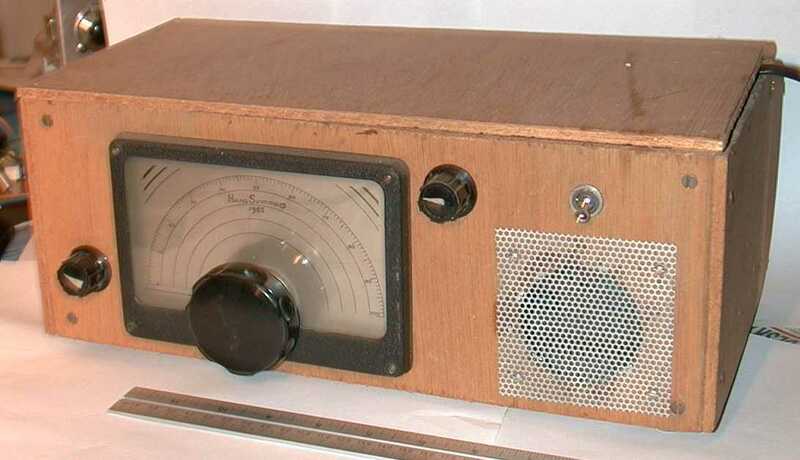 I built this simple regenerative short wave radio receiver in 1982 with a lot of help from my Dad. It ran on a 9 volt battery installed in the back of the box, on the right hand side. The box was made entirely of plywood. It worked well and when I tried it recently, I was happy to find that it still does! As you can see from the ruler placed alongside in the photo, it was quite large. It was only later that I had this crazy idea of making all my circuits totally miniaturised! 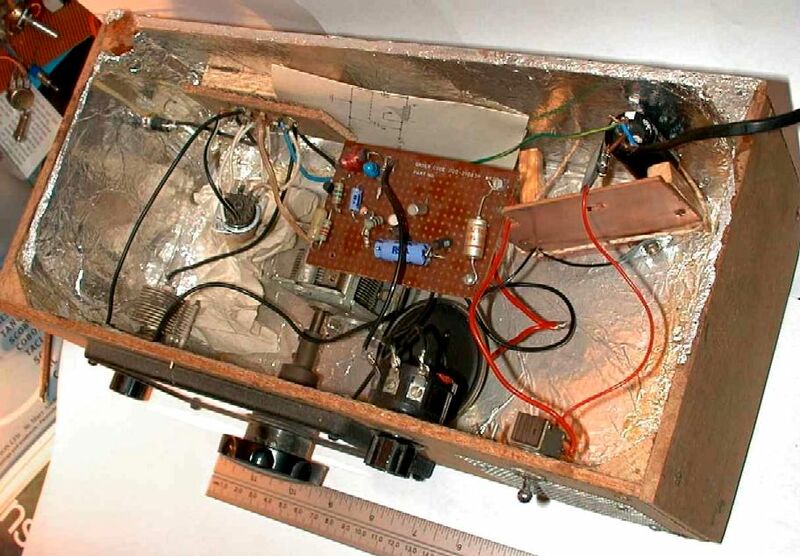 Inside the box, you can see the tuning coil to the left, with the small circuit board suspended in the centre of the box. Aluminium kitchen foil was stuck all around the inside of the box for RF shielding purposes. The design is by my Father. Aged nearly 11 at the time my transistor circuit design skills weren't quite there yet... The tuning capacitor is approximately 300pF. The tuning dial incorporates a reduction drive mechanism which is very useful since the receiver covers several MHz. The connections to the coil are to pin numbers (from top to bottom) 4, 3, 5, 2, 9 and 8. The aerial used was just a long piece of wire strung out in the garden. Many thanks to Ted Lester, who sent me the nicely drawn schematic shown below. He created it using Paint by placing text and cutting and pasting component symbols. The tuning coil used in this receiver is a Denco Green type. Denco coils were popular in the UK in the valve era, they are a little smaller than a small valve (e.g. EF80) and are mounted on a 9-pin base which fits a valve socket. In the "inside" photograph above, the coil is at the left of the receiver, but can't be seen clearly since it is upside down and only the underside of the 9-pin valve socket is visible. (See also my valve receiver photographs; this receiver also uses a Denco coil, partially hidden behind the main tuning capcitor in the photograph). The coils were packaged in a small cyclindrical tin, very similar in size to a 35mm film canister. If desired this tin could conveniently be used for coil shielding. I have now scanned this rather historic A5-sized document, suitably aged and yellowed: click image thumbnail to the left. Thanks to Howard Chadwell who sent me a more recent edition of the Denco datasheet, showing a skeleton superhet circuit and giving much more information. CLICK HERE to download an Adobe Acrobat .pdf version of this datasheet (167K, best viewed with the "Actual Size" setting). CLICK HERE to download a high resolution version (1,181K). Denco coils are no longer easy to come by. This article shows how to build your own equivalent. Complete Data and Recommended Applications. 40-page Data and Application booklet scan (thanks to Graham G3MFJ).